Weekend Reading: Happy New Year! Published January 4th, 2010	in Misc. Welcome to 2010! I wish you and yours a happy, prosperous and healthy new year. TrimTabs Asks: Who Is Responsible For The Non-Stop Market Rally? And remember to check back often as interesting links are added throughout the week. 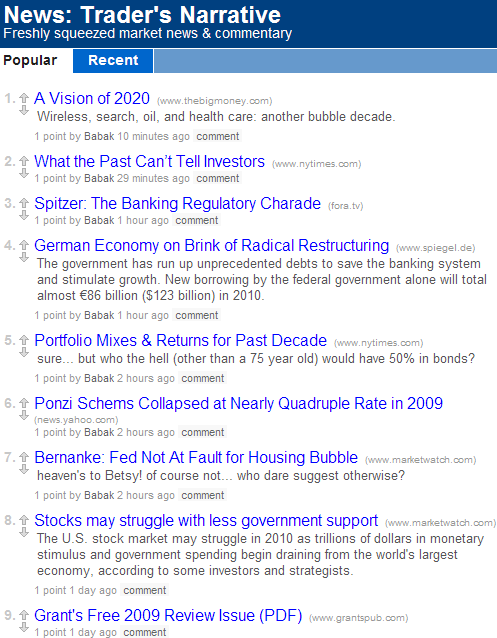 If you’re on twitter, add the news.tradersnarrative.com twitter stream to get new links in real time.